Our winter season meetings continued in February when members were treated to a well-illustrated talk by Bryan Short, covering the fate of Alexander the Great’s generals, their interactions and achievements. The premature death of Alexander with no clear successor was the signal for massive infighting to carve up his dominions. The two principal Greek successor states of the Persian Empire, founded by two of the longest serving generals, Ptolemy and Seleucus, both lasted for well over 300 years and played a significant part in expanding the influence of Hellenistic civilisation and culture. Besoms, Battledores, Bedsteads and Bum Rolls – the role of women in the C17th was the intriguing title of our March meeting. Our Stuart female ancestors may be people with whom we can identify or they may be lurking, nameless, waiting to be discovered. The evening provided members with an all-important context for these women. Delivered by Dr Janet Few as Mistress Agnes in period costume, the presentation described the many tasks of the C17th housewife in maintaining the smooth running of the household. In April following the AGM, Dr Stephan Harrison, from the Cornwall Campus of Exeter University, kept us all enthralled with a talk on the Glaciation of Dartmoor. For the past 70 years, it has widely been assumed that southwest England was an unglaciated area and the southern edge of the British continental icecap was in the region of Bristol. Dr Harrison claims that there is compelling evidence that earlier theories need to be revised. Plateau ice field glaciation has been found in several locations on northern Dartmoor, whilst other indicators such as the positioning of larger castellated tors in areas thought to be too fragile for the ice cover to survive and the almost torless centre of the moor are further evidence of periglacial activity. The proposal to construct a waste disposal incinerator at Devonport was very controversial when first mooted, causing much concern about potential pollution, offensive odours and poisonous gases. Nevertheless the decision was made, the plant started operation in 2015 and has now been working for two years. For the first of our summer outings, clad in safety helmets and high visibility vests, a party of us followed the process from the arrival of rubbish through to the neutralisation of the noxious gases produced. Of the combined heat and power generated by the combustion process, a proportion goes to the National Grid but considerably more goes direct into the Devonport Naval Base replacing natural gas heating and reducing carbon dioxide emissions by around 77,000 tonnes a year. 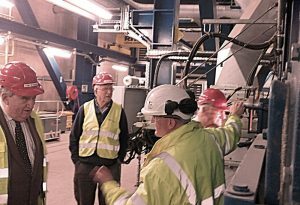 Members were impressed by the energy efficiency and high technology involved and by the obvious commitment of the organisation to the local environment. An evening trip on the Tamar Belle Heritage Railway through the Bere Peninsula and the heart of the Tamar Valley in late June proved to be very popular, spanning the majestic Tavy viaduct and the even more spectacular viaduct at Calstock with its sweeping views down on to the river and the village below, and passing through areas steeped in the history of industrial mining. Alighting at Bere Ferrers, the group were invited to look over the small railway museum and other artefacts whilst complimentary drinks were served on the platform. The evening finished with an opportunity for everyone to relax over a splendid four course meal served in a Pullman style first class restaurant carriage. Finally, in early July, to mark the 90th birthday of Helen Harris, one of our longest-serving Branch members, and in celebration of Helen’s many achievements, a lunch at the Bedford Hotel was held in her honour attended by representatives of the historical groups with which Helen has been associated over the years.